This Place of Worship was founded in 1849, and we understand it is still open. The central porch has a shield-shaped tablet with (much decayed) inscription 'Wesley Chapel 1849'. So says Non-Conformist Chapels and Meeting Houses, Gloucestershire (1986, p.79) Their account also draws attention to "sharply stepped octagonal corner buttresses surrounded by tall thin pinnacles", and "elaborate cross finial to the gable". 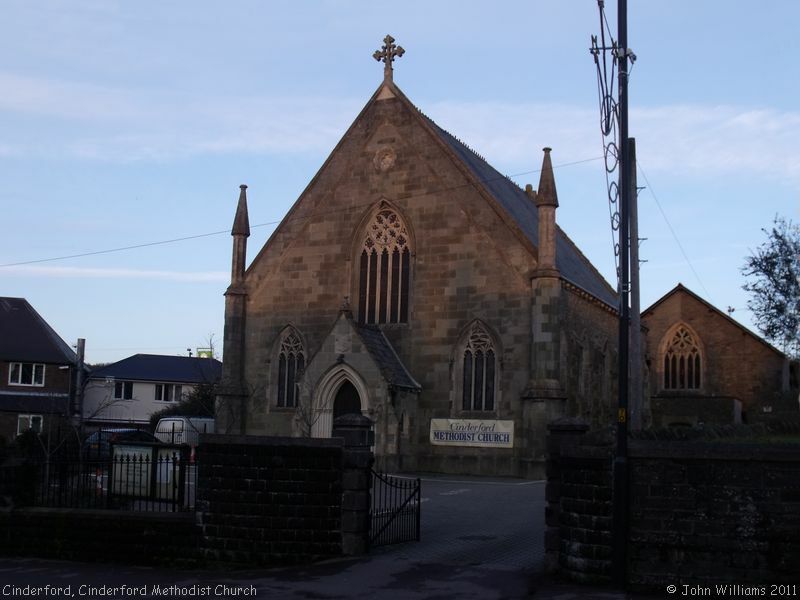 The account of the Chapel on the Gloucestershire Methodist Circuit website records a description of it as 'the most beautiful building in Cinderford'. Interestingly, I have been unable to find a record of its registration for marriages. Cinderford Methodist Church, Cinderford shown on a Google Map. Places of Worship in Cinderford shown on a Google Map. I have found many websites of use whilst compiling the information for this database. Here are some which deserve mention as being of special interest for Cinderford, and perhaps to Local History and Places of Worship as a whole. Information last updated on 26 Jan 2019 at 14:35. Please also remember that whilst the above account may suggest that Cinderford Methodist Church remains open and accessible, this may not remain so. This Report was created 25 Mar 2019 - 07:49:34 GMT from information held in the Gloucestershire section of the Places of Worship Database. This was last updated on 7 Feb 2019 at 07:45.